Branching out a bit from the Mac Setups, here is a great iPad setup! 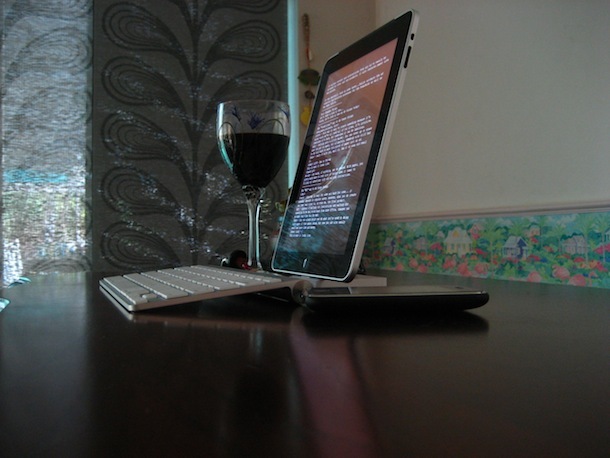 The iPad rests comfortably in a dock and is connected wirelessly to a bluetooth keyboard, surrounded by a glass of red wine and an iPhone. Classy huh? Now this is a gorgeous Apple setup! Do you ever use an iPad like this? Or do you just stick to the Mac? There’s something wonderfully minimalistic about just an iPad and a keyboard, but is it enough to get your job done? Depends on the work I guess, but for many users, it certainly would be. Thanks to Andy for sending us the link from MinimalMac. Have any other interesting Apple setups, iPad setups, Mac setups, or whatever else? Do share them with us!